Systems Plus Transformations is a global boutique Information Technology Solution and Services Provider with customers in Europe, North America and Asia Pacific. Our presence in India, UK, US enable us to serve our valued customer globally using near shore and offshore delivery models. Our aspiration is simple – to align ourselves to the business transformational objectives of our customers and assist them in optimizing the transformation for their success. This ensures that our customers thrive in the changing business environment. We build strong and powerful relations with our customers over a period of time by understanding their business. With this we help them to improve their productivity by ensuring that the Business as Usual operates in an optimised way, more faster and cost effective. At the same time keeping an eye to the future and assisting them to explore and innovate towards newer technologies and processes. The Systems Plus team is energetic , committed , passionate to work collaboratively to deliver excellence for our customers. We believe that our responsibility is to go beyond business and therefore we have a strong CSR program where our team devotes regular time to assist the socially and economically depressed sectors of the community in which we operate. In conclusion, there will be many changes in the business world at the moment, but there are some things that stay the same. 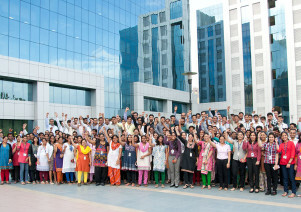 We’re still just as dedicated and passionate to help our customers achieve their business transformational objectives.